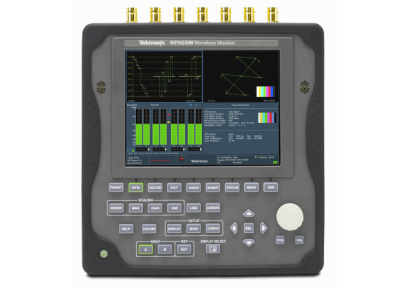 Tektronix, the market leader in broadcast video test, monitoring and analysis solutions, has announced the availability of the portable WFM2200 waveform monitor, the latest addition to the company's industry-leading line of waveform monitors and rasterizers. The WFM2200's combination of features and performance make it ideal for broadcasters and video content producers requiring a portable waveform monitor to install, configure, maintain and troubleshoot their video equipment. No longer are broadcasters and those in video content production only monitoring basic SD-SDI video and analog audio. They now have to diagnose multi-format video, multi-channel/format audio, and complex ANC Data that supports today's modern broadcast systems. With all this complexity technicians need easy to use, performance level products at an affordable price. The WFM2200 uniquely incorporates the exceptional performance of Tektronix' advanced waveform monitors in a portable unit. Complementing this, the WFM2200 is customizable via software, enabling customers to add any additional capabilities to the base model to better suit their needs, rather than pay for a fully configured unit with unneeded capabilities. "Our new WFM2200 sets a new standard for portable waveform monitors, combining outstanding performance, exceptional portability, and configurable to meet customers' specific requirements," said Eben Jenkins, general manager, Video Product Line, Tektronix. "The WFM2200 is the latest example of our commitment to innovation and creating waveform monitors that are cost-effective while meeting customers' most demanding requirements." A large 6.5 inch, high resolution liquid crystal display (LCD) ensures users will not miss a potential issue because of low-quality waveform representation. A replaceable battery enables users to work longer with one battery charging while another is in use. An input for testing the facility synchronization signal, or "House Black", including a unique Timing display which simplifies setup and verification. In addition, to troubleshoot timing problems and verifying compliance the WFM2200 offers the ability to view the analog reference signal. The WFM2200 is available now globally and has a starting price of $4,900 US MSRP. For more information about the WFM2200 visit http://www.tek.com/waveform-monitor/wfm2200. For more than sixty five years, engineers have turned to Tektronix for test, measurement and monitoring solutions to solve design challenges, improve productivity and dramatically reduce time to market. Tektronix is a leading supplier of test equipment for engineers focused on electronic design, manufacturing, and advanced technology development. Headquartered in Beaverton, Oregon, Tektronix serves customers worldwide and offers award-winning service and support. Stay on the leading edge at www.tektronix.com.